Last Chance Sale! Receive Free Expedited Shipping on ALL Orders at OzoneSocks.com. No Code Needed – Offer Valid 12/16 – 12/21. Click here to use. 12/4 – 12/18 Save 25% On Sock Of The Month Club At Ozonesocks.com With Code: DECSOTM. Free Shipping Included. Click here to use. 12/4 – 12/18 Save 15% On Holiday Socks At Ozonesocks.com With Code: DEC10. Free Shipping Included. Click here to use. 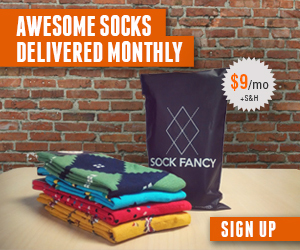 Save $10 On Orders Over $80 at OzoneSocks.com! Use Code – 10offover80. Click here to use. 25% Off Orders Over $50 at OzoneSocks.com! We’ve discussed The Sox Box in the past because its a simple online sock store where part of your purchase is contributed to charity. For the holidays, The Sox Box is offering 10% off all orders when you use the coupon code “SAVE10” at The Sox Box. What can you buy at The Sox Box? The Sox Box has a variety of sock styles that you can buy from their online sock website, including running socks, gym socks, ankle socks, knee socks, crew socks, and more. You can also choose custom patterns such as holiday or patriotic sock patterns. How does their Charity Donation work? The mission of The Sox Box is to give 20% of all proceeds back to charity. Their website lists a variety of charities that they contribute to, including veterans’ charities, healthcare research, education, and food & hunger prevention organizations. What’s the coupon code for The Sox Box? Use the coupon code “SAVE10” at checkout at get 10% off any order at The Sox Box.